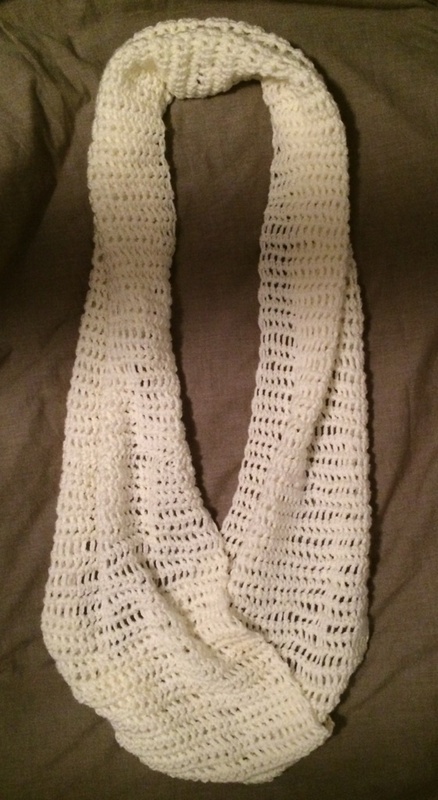 Love infinity scarfs? Love colour? 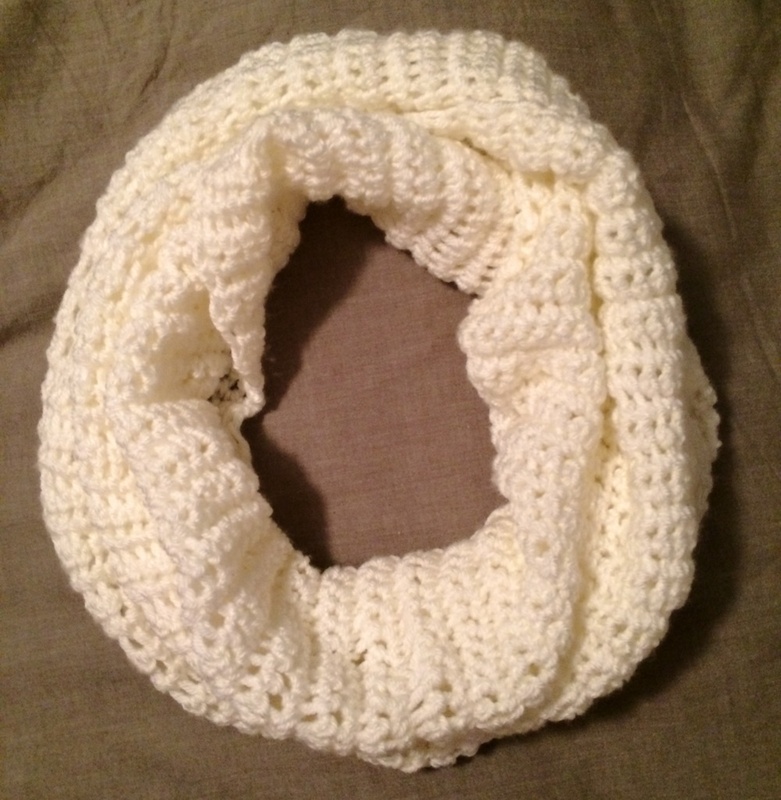 Looking for an easy-beginner level crochet pattern that you can whip up in no time while watching tv!? Well well, I have a solution for you! 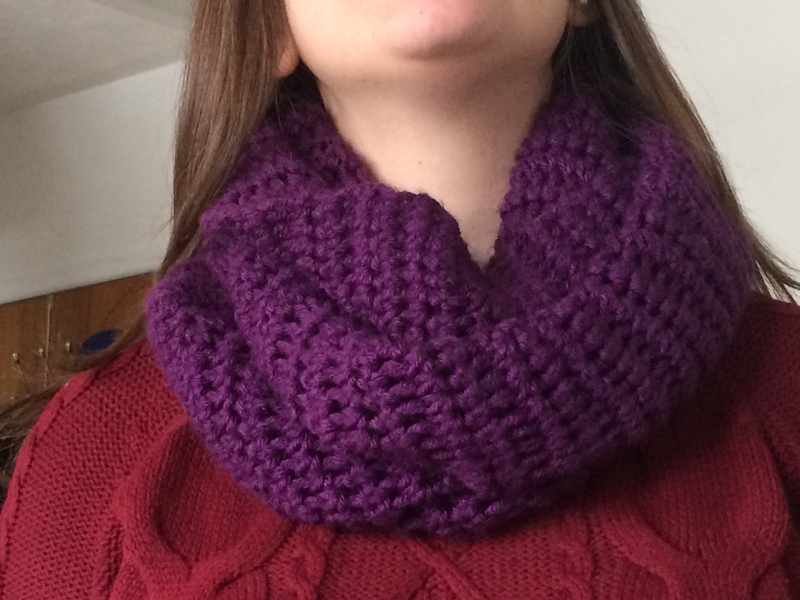 I started making crochet infinity scarfs about three years ago as Christmas presents, then got a little carried away last Christmas and I made them for almost everyone! Looks cozy right? So right! Well this is incredibly easy to make and is just a bunch of back and forth and back and forth row after row after row with a twist and a connection at the end once its long enough. 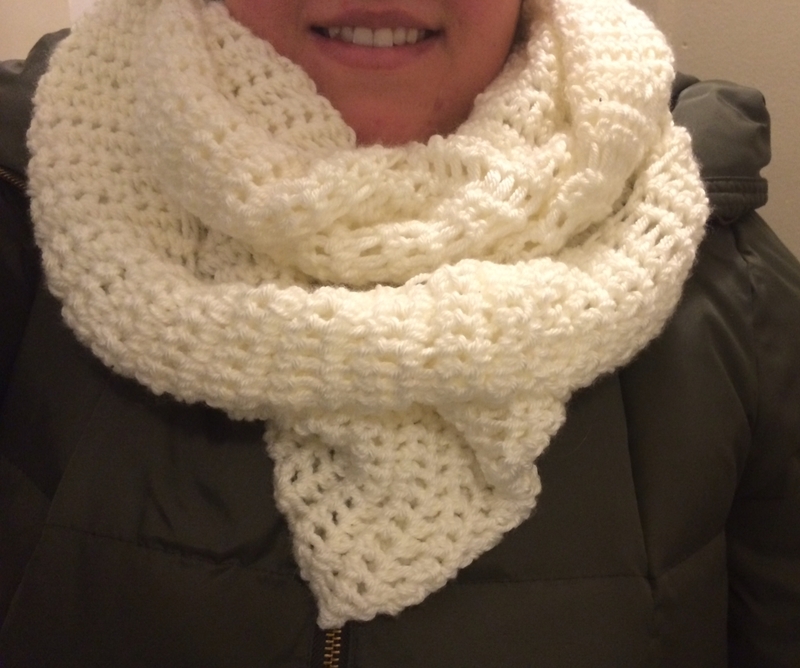 I usually make the scarfs long enough to wrap around the neck twice and put a twist in it to make it look fuller when worn. While it has come to my attention that I should perhaps post a tutorial on the essentials of crochet, that’ll come after the weekend when I’ve got some time to sit down and take step by step photos of the basic stitches 🙂 But for now, here is the way simple pattern (no joke…too easy). Usually I stock up on yarn at Michael’s when it goes on sale. 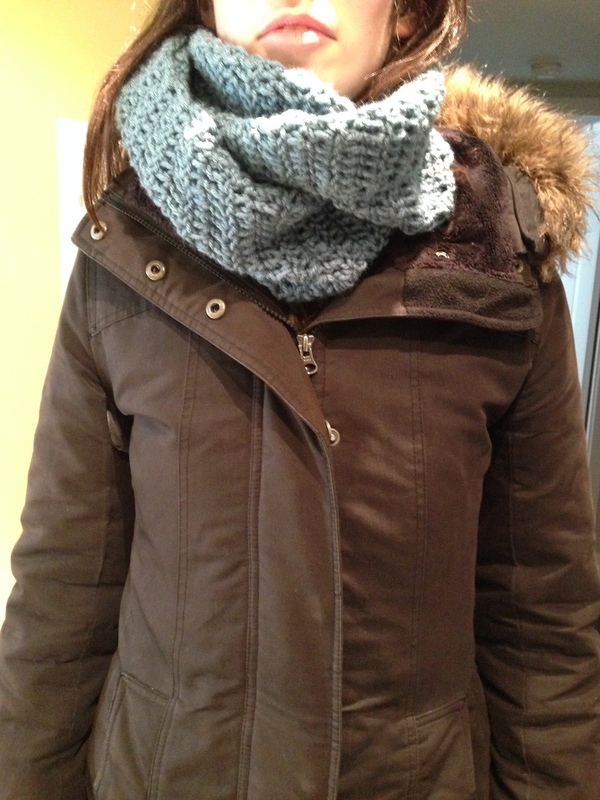 I can typically get a scarf out of two regular sized balls of yarn. I’ve used these brands in the past with great success: http://canada.michaels.com/on/demandware.store/Sites-MichaelsCanada-Site/default/Product-Show?pid=C_nw0435 and http://www.lionbrand.com/yarns/vannaschoice.html Both have great colours and are the same weight/texture so its easy to work with. I tend to work with 4-5oz weighted yarns. 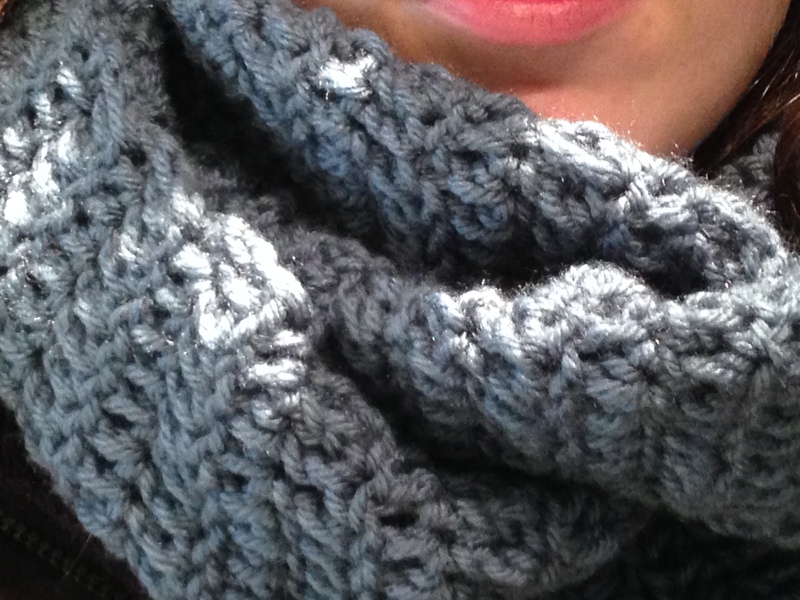 And the softer the better, as no one wants to wear an itchy scarf! I’m not a fan of working with really thin or light weight yarn as I usually end up in a tangled mess! I also like to use varying crochet hooks to get different gauges and thickness. Most of the time I’ve been using a size 5 hook, but the blue one up top I think I used an 7or8. 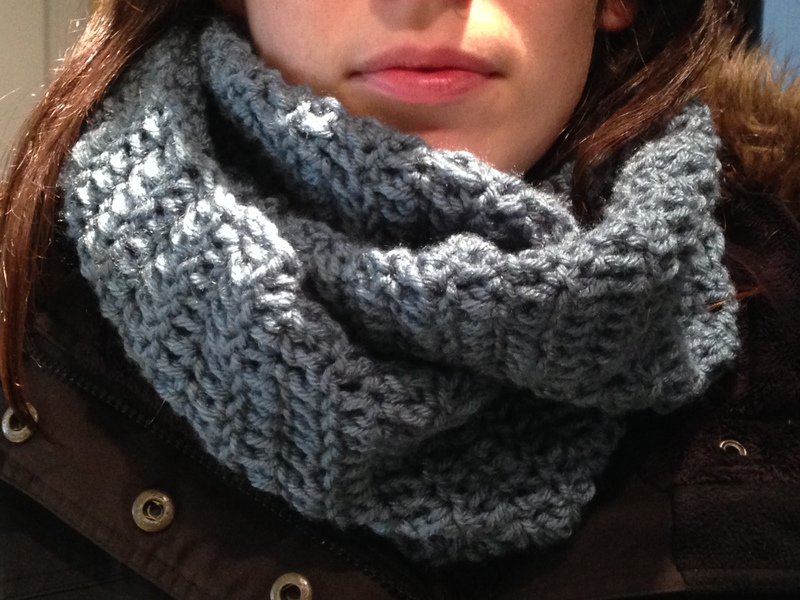 For the purpose of this post, we’ll stick to size 5.
chain 25-30 (or more, this will be the width of the scarf. You’ll want it wide enough to have a fold for warmth). starting in the second “V” from the end, double crochet (dc) all the way across, making sure not to miss any stitches. I find the first row always the hardest, and sometimes have to redo it if I made my initial chains too tight! Repeat repeat repeat: chaining two, flipping, dc starting in second stitch all the way across, chaining two, flipping,dc starting in second stitch all the way across etc…. Occasionally I like to stop and count my stitches across. (You can count the “v” shapes across the top) to make sure you haven’t missed any. If you’re missing one, don’t despair just do two dc into one space on the way back. If you’re missing a whole bunch, you may want to rip out some rows to get back on track. Don’t sweat it, it happens. ONE: With the edges touching and lined up all the way across, single crochet into all the spaces all the way across, tying off and weaving in the ends. TWO: With the edges touching and lined up all the way across, take a yarn needle and stitch a seam all the way across, tying off and weaving in the ends.